During my doctoral study phase I've developed new algorithms for the MPI+X parallelization of simulations on dynamically adaptive give. contribute to the embedded systems demonstrator with the development of scientific algorithms on the target platform. 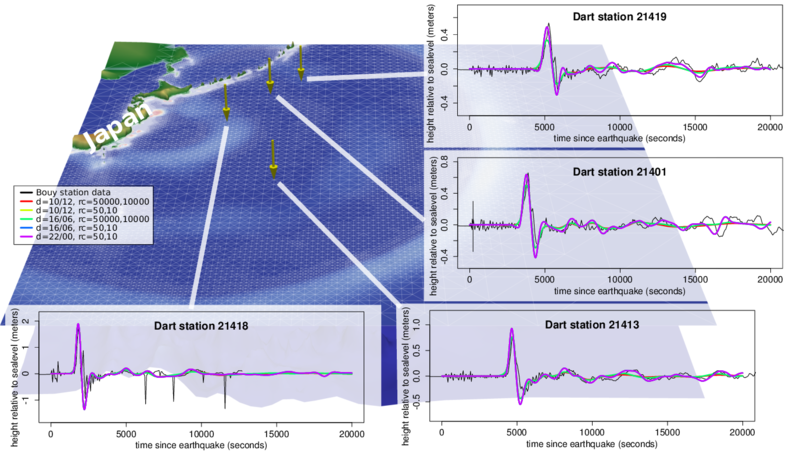 Results for the Tohoku Tsunami simulations on dynamically adaptive grids. Bored of science? Impressions with examples of Tsunami simulations can be found on the dedicated video website. If you are interested in more details, please have a look in my Doctoral thesis "Cluster-Based Parallelization of Simulations on Dynamically Adaptive Grids and Dynamic Resource Management" which is available for download (PDF) and as an HTML version. My doctoral studies were part of the Invasive Computing D3 transregio project.